The Sons Of Liberty - Bradlee Dean: What Will be America's Fate? That is Up to You! 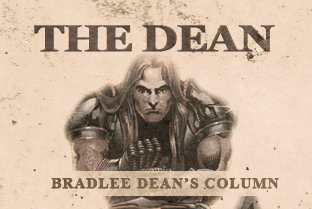 Home - The Dean-Bradlee Dean: What Will be America's Fate? That is Up to You! The Germans told the Jewish people they couldn't swim in their swimming pools, but no one protested too strongly. Then they said they couldn't attend their schools, "No problem," said the Jewish people, "We'll make our own schools." Little by little their rights were stripped from them and taken away through deceptive measures, but no one ever imagined the horror that awaited them because they tolerated the beginning trickles of injustice that left governmental power unchecked, which ended up billowing into one of the most tragic events in history. Everything that Hitler did looked like law, smelled like law, even had the color of law, but was not law. What is it that we have learned from looking back and studying the past? John Adams, the second president of the United States, stated, "Fear is the foundation of most governments; but it is so sordid and brutal a passion, and renders men in whose breasts it predominates so stupid and miserable, that Americans will not be likely to approve of any political institution which is founded on it." Is America walking contrary to John Adams' statement? You decide. Today, those who stand for the Constitution, the sanctity of life, and the traditional values of morality our country was founded upon, are now labeled as un-American haters. Vladimir Lenin, First Leader of the Soviet Union, said, "We can and must write in a language which sows among the masses hate, revulsion, and scorn toward those who disagree with us."